How to Prepare Your Puppy to be a Therapy Dog - Alliance of Therapy Dogs Inc.
As one of the largest therapy dog organizations in the United States, we are often asked how to train puppies to become therapy dogs. There are several things you can do to help prepare your puppy to offer comfort to those in need. In this article, we will explain a few of the most important steps to help prepare your puppy to become a therapy dog. Socialization and the element of trust are, arguably, the most important characteristics a therapy dog must possess. It is important to expose your puppy to new people as often as possible, keeping the interactions pleasant and unthreatening. The focus should on pleasant encounters with unfamiliar persons, well-behaved children, as well as people wearing uniforms, hats, and glasses. As your puppy is being introduced to new people and places, be prepared to expect the unexpected as one negative experience can have a life-long impact on a puppy. It is also important not to overwhelm the puppy with socialization experiences, so stop while you and your puppy are still having a good time. It is much better to have short, frequent and positive experiences. Another good way to develop the puppy’s trust is to discover the things that you and the puppy like to do together. It is important to allow the puppy to experience different things – go on walks, take hikes in the woods, play in the park, or visit the beach. For experiences that make the puppy apprehensive, take steps to improve the situation or shorten its duration. Puppies will come to trust that you consistently make decisions in their best interest. This trust is the cornerstone for the teamwork needed for every successful therapy dog team. It is also important that the family is involved in the training. By having different people taking part in the socialization process, the puppy is continuously taken out of its comfort zone, letting the puppy know that he might experience something new regardless of who he’s with. Basic obedience training can help your puppy to prepare to become a therapy dog. Obedience training can be done at home or with the aid of a trainer. 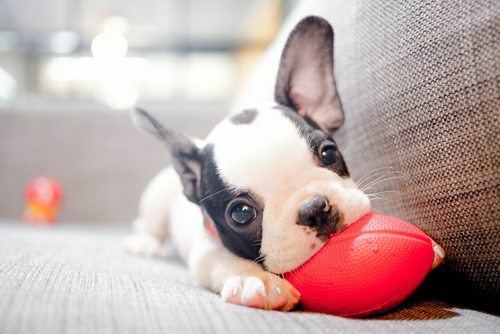 The benefits of obedience training include fostering a compassionate, respectful working relationship between you and your puppy and provides a positive and highly accurate method of communication. 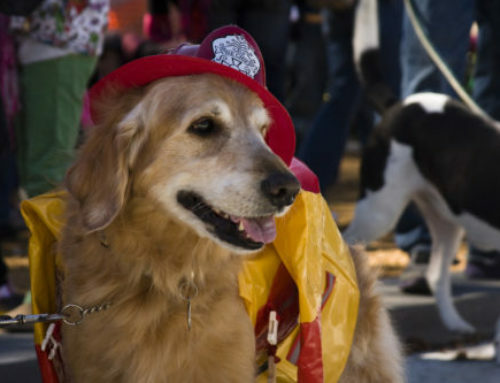 Successful therapy dogs enjoy spending time with people, not just their owner or family, but people they have not previously met. Their strong bond with their owner translates into a trust that you will keep them safe, so they can be more tolerant or forgiving of clumsy interactions or surprising distractions. They enjoy providing comfort to others and seek out interactions. Social Attraction. How well the puppy connects to people and whether it is confident or dependent on others. Restraint. Is the puppy more dominant or submissive? How well can it be handled in difficult situations such as vet exams? Retrieving. Will the puppy bring you something on command? Touch Sensitivity. A puppy’s sensitivity to being handled can help determine the type of training the puppy will need. Sound Sensitivity. Is your puppy sensitive to loud noises? Clap your hands. Does the puppy look at you and approach? This is also a rudimentary test for deafness. Sight Sensitivity. Make eye contact; does the puppy engage in eye contact? This is a good indicator of the confidence of the puppy. However, be concerned about a puppy who will not look at you. This could indicate a temperament or vision problem. Stability. Is the puppy easily startled when confronted with a strange object? Structure. How physically well-formed and proportioned is the puppy? A puppy with a solid build will generally be healthier than one that has concerns with bone alignment. How are Dogs Tested to Become a Therapy Dog with ATD? The Alliance of Therapy Dogs (ATD) has a unique testing process that involves handling your dog. Our testing is designed to make sure you and your dog have a good relationship with each other and that your dog has the right temperament for therapy dog work. After the test, a Tester/Observer (T/O) will monitor you and your dog during three visits to facilities that include two visits to a medical facility. During these supervised visits, the T/O will instruct you and your dog on the art of visiting and give you advice and guidance while observing you in action. If all goes well, the T/O will pass you and your dog and recommend you for certification and registration with ATD. 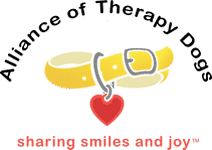 If you would like to know more about training your puppy to become a therapy dog or therapy dogs testing, contact the Alliance of Therapy Dogs.